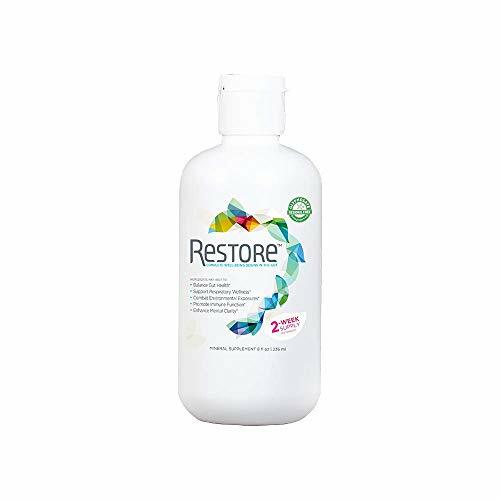 RESTORE is a new generation, soil-derived supplement to balance gut health, support respiratory wellness, combat environmental exposures, promote immune function, enhance mental clarity, and promote hydration. Going beyond probiotics and prebiotics. Rather, it is a carbon-rich, alkaline liquid, comprised of Terrahydrite, a formulation of Aqueous Humic Substances and trace mineral amino acid complexes. It is naturally gluten-free. RESTORE has been shown to create a beneficial shift in the bacteria of the microbiome-what many people are attempting to do with probiotics and prebiotics. Carbon-based redox molecules from ancient fossilized soil help restore the communication network between bacteria in the gut, mitochondria, and cells in the body.